← Another Death in Custody / Police Murder!! The Turnbull government has stacked the independent Climate Change Authority with Coalition advisors and former MPs in a bid to redress what it says have been “partisan” politics from the board of the institution that it had tried to dismantle. The CCA has been a thorn in the side of the Abbott government before and since its election in 2013. The Coalition tried to dismantle the authority, but was stymied by the Senate. 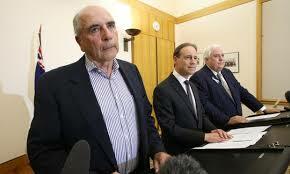 Ultimately, it was saved in a bizarre deal cut with Clive Palmer that led to the repeal of the carbon price. However, the CCA has continued to attack the Coalition, criticising what is saw as “weak” emissions targets, and questioning the effectiveness of the core Direct Action policy. “I respect these views, but I wouldn’t say it’s a body that has no political history,” Hunt said, and foreshadowed the appointment of new members who would be “really credible people”. The appointees include Danny Price, of Frontier Economics, credited as being one of the principal architects of Direct Action and the emissions reduction fund, and Stuart Allinson of consulting group Bid Energy, who also advised the Coalition on Direct Action. Also appointed was Kate Carnell, a former Liberal Party chief minister of ACT and head of the Australian Chamber of Commerce and Industry, a feisty critic of climate change policies, which once accused clean energy investments of “destroying jobs” rather than creating new ones. Carnell has represented the food and forestry lobbies and campaigned for those industries to be excluded from the carbon price. And John Sharp, a former Nationals MP who was once minister for transport, and is now a director of Rex Airlines. Craik replaces Bernie Fraser, the former head of the Reserve Bank, who became a big critic of the Abbott government’s climate policies and resigned one week before Turnbull became prime minister. Fraser accused the Abbott government of bowing to vested interests, was dismissive of Direct Action, and wanted Australia to have much stronger 2030 targets, in the region of 40 per cent to 60 per cent. The Abbott government said Australia’s 2020 target should be 19 per cent below 2000 levels, effectively the same target Australia now has for 2030 – which it now describes as 26-28 per cent 2005 levels, a year of higher emissions than 2000. Fraser was also highly critical of Hunt’s description of a $600 billion cost of an emissions reduction target of 50 per cent by 2030. Price has courted controversy in many of his reports. One, described in our piece Modelling wars: Moulding data to kill renewables, was commissioned by the Australian Energy Market Commission. It showed he was no friend of renewable energy. It assumed that the cost of wind energy was significantly more than it actually was, and assumed that the cost of solar power was also double what it actually was. Then it predicted that neither technology would experience cost falls in the coming 20 years. That, of course, was absurd. But it provided the basis of modelling that assumed that only wind power would fill out the renewable energy target, probably the basis for the Coalition’s subsequent push against wind power. Almost all analysts now expects solar to be the majority supplier of the RET. Frontier also labelled the RET as a “transfer of wealth from coal-fired generators to consumers”, and questioned whether even a much reduced target of 23,000GWh – it was later cut to 33,000GWh from 41,000GWh – could be achieved. Hunt complained about the lack of recognition for Australia’s per capita reduction targets, which he said were the heaviest per capita in the developed world. “Perhaps, as a country, we should say, that’s pretty impressive,” he told the All Energy conference. Through a majority decision, maybe that’s what the CCA board might now be saying. Should be a fascinating board meeting though.